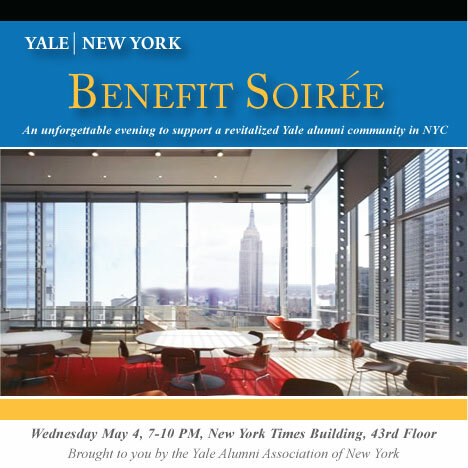 YaleNet - Smart Matters - BENEFIT SOIREE TONIGHT! Mix and Mingle at the Second Annual Yale New York Benefit Soiree! Join New York's community of notable Yale alumni for an unforgettable evening of merriment, food, and drink in the gorgeous glass and steel atelier in the sky designed by world-renowned architect Renzo Piano in the New York Times Building. Expect breathtaking sunset views over the Hudson & southern Manhattan, open bar with our signature Bulldog Gin Cocktail and wines, gourmet hors doeuvres and a cheese tasting by Joy of Cheese! *** Bulldog Sponsor Tickets: $100, includes special acknowledgement in the event program & website and a special gift. All Yalies and family/friends/guests are welcome to attend this fabulous event. Be sure to check out our online BENEFIT AUCTION with an amazing assortment of items including a winetasting, dinners for two, private flight to the Hamptons, luxury hotel stay, career development, spa packages, custom shirts and MORE! Yale Alumni Association of NY is a volunteer nonprofit committed to providing opportunities for all Yale alumni in the New York metropolitan area to connect and make a positive impact in the community. Your support will help us overhaul our technology and communications strategy, fuel our efforts to develop local and international programming for Yale alumni, and support our mission to nurture and showcase the rich tapestry of Yale activity in the city. We're here for you and we're excited about the possibilities. We would like to gratefully acknowledge Covington & Burling, Philip K. Howard '70, and Common Good for their generous sponsorship of this event. Common Good is a bi-partisan non profit legal reform coalition whose mission is to restore common sense and individual responsibility to all areas of government, law, and society (www.commongood.org). Benefit Committee: Chad Berkowitz '00, Patrick Castillo '92, Aleta Davies '78, Elisabeth Enenbach '02, Jennifer Fulham '03, Aisha Gayle '02, Garrett Jewett '77, Carla Lien '77, Lisa Lee '91, Anna Maslakovic '88, Sibile Morency '05, Anne Nakaoka Moss '77, Tracey Ober '85, Tiffany Petrosino '10, and Holland Sullivan '01.